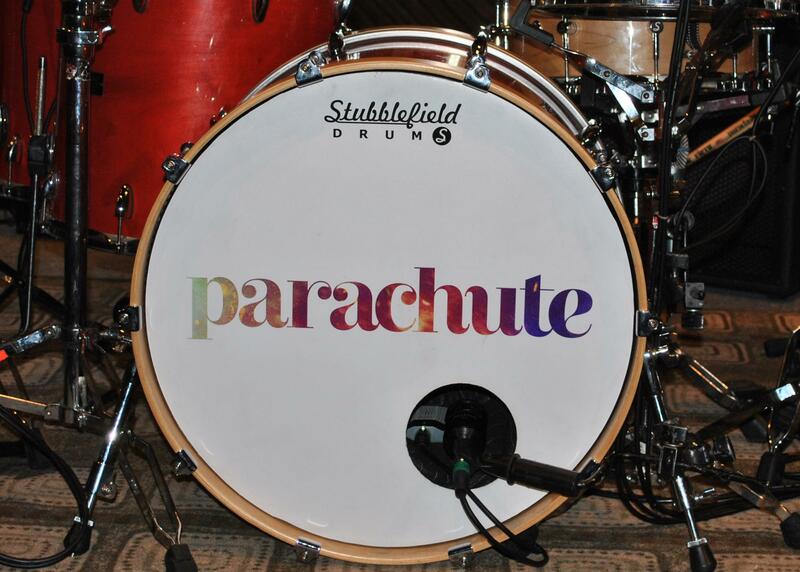 For the members of Parachute, a hard touring band from Charlottesville, Virginia, the night exerts a strong influence on the music they record and perform. Need proof? Look no further than title of their new album:. As darkness falls over central Virginia, five merry wanderers of the night look to make some midsummer magic. For the members of Parachute, a hard touring band from Charlottesville, Virginia, the night exerts a strong influence on the music they record and perform. Need proof? Look no further than title of their new album: Overnight. "We always seem to come back to the night," Kit French, the keyboardist and saxophone player of the band sits back on a well worn couch. "'Overnight' was a song on the album. We liked the song, liked the feeling... we rolled with it." I met up with the band at the Jefferson Theater, a popular concert venue in their hometown, as they prepare to play to another packed house. Drummer Johnny Stubblefield joins Kit and offers his thoughts about after hours. "We spend a lot of late nights in the studio. Night is an important time. It can be a time you're with a girl or a time you are writing, recording in the studio. All of the most important things happen at night." In the early years, night not only meant performing and recording, but it also meant driving. Driving from gig to gig is a rite of passage for all bands. Before graduating to their current luxury touring bus, the band paid their dues in the van. As the band tells stories about the road, images form of the van quietly slipping down the dark interstate with the unmistakable smell of a freshly opened Red Bull in the air. Surviving the driving between gigs can be hard. Sleeping on the van was a necessity for the members riding in the back. Reassurances that the driver was fully awake went a long way towards helping achieve rest. "I always slept well when I heard the driver singing to the radio," Johnny recalls. "Repeatedly hearing the rumble strip is a different story," added Kit. Johnny shakes his head as Kit immediately recites the first law of the van. "When you ride shotgun in a tour van, you stay up to help the driver." While the rule seems straightforward, it was a tough task for guitarist Nate Hargrave. "Nate falls asleep immediately which is bad," Kit laughed. "But it gets worse. He would wake up and say the worst things in his sleep, scream out, and throw the empty Red Bull cans at the driver." 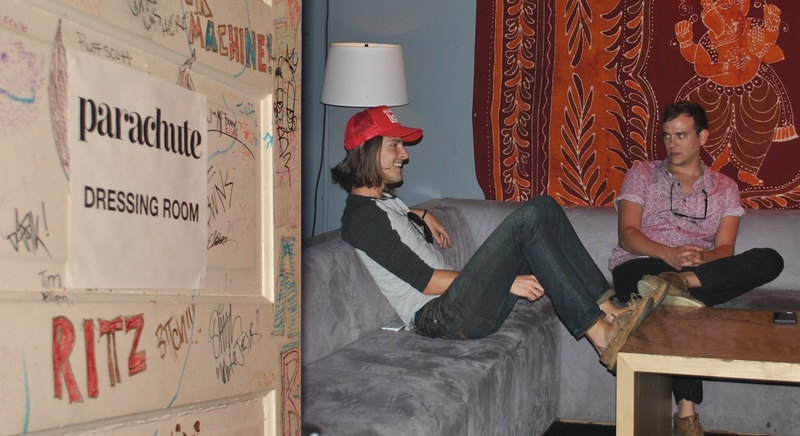 When asked if the cumulative lack of sleep was a reason for Nate's departure, Kit replied, "It probably played a small role, but he really had another path to follow. No question that the sleeplessness does add up. He was a sleeper though. Nate could fall asleep anywhere." Despite the high amounts of caffeine consumed and the near constant guerrilla napping, accidents happen. "We had a slight accident in Wyoming. We spun out on ice... did a complete 180," Johnny recalls. "I was driving and Alex (bassist Alex McFarland) was asleep in the trough, the floor of the van, when I heard, 'We're going down.' We were all okay, but we had to have a tow truck come because the driver's side tires were all blown out." The wreck would change nothing. If anything, the driving and touring became more intense. The hardest drive for the band was the Denver to Salt Lake trip, a common leg for bands. "Everybody knows it." The band echoes. It's a natural drive for a touring band. If you have a hired driver, you pay extra for it. We did it ourselves by driving through the night." Invariably, even the longest drives, just as the longest nights, come to an end. This end is usually marked by scrambling for sleep in a new city. Outside of the most dire situation, the van is not a desirable sleeping option. Given the countless hotel nights Parachute has spent on the road, I asked the group about their worst sleeping experience. Kit does not flinch. "Nashville." Johnny's expression of being kicked below the belt supports Kit's nomination. "Nashville has a strangely expensive hotel market, so to save money we rolled in one night to a hotel a little outside of town. The parking lot was dark and adjacent to a night club. There was drag racing going on all night. The place was totally grimy." Despite the awful conditions, the band dropped their bags into the rooms and collapsed onto their beds. As the band slept fully clothed on top of the sheets, they all knew it was better in a seedy hotel than on the van where some would sleep fitfully on benches while other unlucky band mates would draw the trough. These stories of trough sleeping, midnight drag racing, and violently snoring roadies (at least one of whom may have snored himself out of a job) makes their debut album title Losing Sleep seem like a obvious choice. Kit brings up Will Anderson, the group's lead vocalist and guitar player. "Will does most of the writing. He's a night owl. It's part of his writing style, staying up all night." The late nights and lost sleep have slowly paid off as the group's long hours have cultivated a devoted following across the country. "I'm not as much of a night person," admits Kit. "When it comes to sleep, there are different parties within the group. You just have to go with the majority." That can be difficult when the band pushes through long hours in the studio. "We can be in the studio from noon to 3:00 or 4:00 a.m. If we are tired, it can quickly become a silly and unproductive time," admits Johnny. Losing sleep, in Kit's eyes, has taught the band to sleep better. "We are so good at falling asleep... even jet lag is not a factor for us." Johnny adds, "When you are already so exhausted, it does not take long to fall asleep in a city and adjust." While their ability to adjust to the time zone may not be a problem, the day in and day out of life on the road can be harder to manage. "The road just makes your life difficult to coordinate. Trying to find a shower at the venue is hard. Eating a healthy diet is hard," Kit says listing the hardships on his fingers. "We eat the stereotypical food on the road. We try to keep it simple and healthy. We eat lots of Cliff bars, but we can also get down on the Sheetz biscuits!" "We miss stability," says Johnny. After a while we just want to get home when we are out there. When we get home, we love it for about a week then we want to back out on the road." Kit agrees. "It took us 10 to 12 years for us to get where we are. In the high school days it was a grind, cramming shows in Thursday through Sunday night and going to class in between. After high school and college, being on the road was non-stop. Nine months out of the year we were playing shows." The band has found their rhythm on the road and become more comfortable with the lifestyle. A big part of that adjustment has been because of the band's fans who will soon flood the concert hall upstairs. "We're lucky to have such supporting fans. We have a real desire to continually elevate the show for them." Those fans have come tonight expecting something from this band. On one of the last nights of the summer, this band will emerge from the shadows off stage to show this crowd how magical the night can be.